Color-enhanced infrared filter GOES satellite view of the Atlantic basin on 28 October 2010 at 2245 EST showing Tropical Storm SHARY moving toward Bermuda, and pre-cyclonic wave #90L over the open Atlantic waters moving west by northwest, as well a the large tropical wave #91L near the South American coast, which appears to have gotten better organized and taken a track more toward west by northwest, which will take it toward the Lesser Antilles. 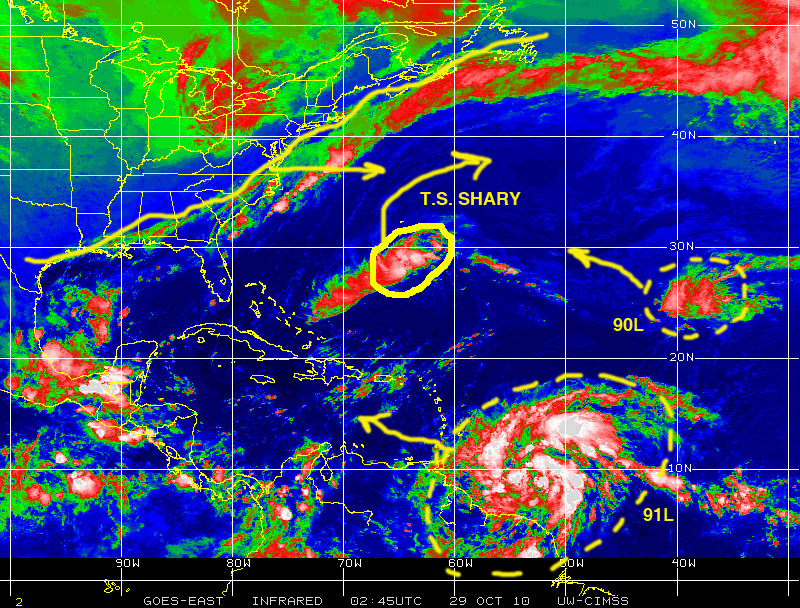 The pre-cyclonic wave over the Atlantic, which had been identified as #92L, has strengthened this evening and it is now Tropical Storm SHARY the 18th named tropical cyclone of the 2010 Atlantic hurricane season. The storm is moving rapidly, at around 25 mph, toward the northwest, but it is expected to re-curb first toward the north and then the northeast under the influence of the powerful storm front moving eastward over the coastal Atlantic USA states and subsequently under the effect of the Coriolis force. The storm should approach Bermuda as it makes the projected turn. The other two waves, of the “trio” we identified earlier today, continue to be active and showing signs of getting better organized and somewhat stronger. Pre-cyclonic wave #90L is srtill moving west by northwst, but should re-curb toward the north and then northeast as it gets closer to the USA coastline. The quite large #91L tropical wave off the coast of South America also appears better organized and sronger, while it has shifted its trajectory more toward the northwest, which will take it toward the windward Islands and the Caribbean beyond. This system warrants close monitoring as it gets closer to the Caribbean over the next 24 – 36 hours.